Ascending Butterfly: Would you like to @EscapeMonthly ? Check out the #SubscriptionBox that takes you to a new destination every month! Would you like to @EscapeMonthly ? Check out the #SubscriptionBox that takes you to a new destination every month! I just took a trip to India, and it didn't cost me a thing! OK I confess I didn't go to India, but I sure came super close when a box full of exotic arrived at my door and I opened it's treasures. I am a huge fan of subscription box services and 'of-the-month' type clubs, they give you a taste of everything under the sun and in my opinion are always great gifts for those hard to shop for folks on my gift list. Escape Monthly is a subscription box service that is perfect for all travel enthusiasts and anyone with a lust for life who wants to experience something different, new and off the beaten path. Ƹ̵̡Ӝ̵̨̄Ʒ - Korma Simmer Sauce by Saffron Road Food - A rich and flavorful sauce with an Indo-Pakistani Heritage that contains an aromatic mixture of cardamom, turmeric (which you know is good for your heart right? ), and other spices in a creamy coconut milk and yogurt base. It is all natural, Certified Halal and NON-GMO (genetically modified) Verified! You can add almost anything to it, not just chicken, you can add your turkey, lamb, pork or even shrimp if you prefer seafood instead! Ƹ̵̡Ӝ̵̨̄Ʒ - Maya Kaimal Kashmiri Curry Indian Simmer Sauce - A very balanced Curry coming from the mountainous state of Kashmir with hints of nutmeg and mace adding balance to it's very rich tomato flavor. Add Cubed Lamb or chicken and vegetables. Ƹ̵̡Ӝ̵̨̄Ʒ - Chai Masala Popcorn with Assam Tea - Masala Pop is an Indian-spiced popcorn snack mix that is actually handcrafted here in the USA in Portland Oregon, using air-popped, organic non-GMO popcorn and adding a special blend of Indian Spices. They are fiber rich and filled with flavor! Ƹ̵̡Ӝ̵̨̄Ʒ - Banyan Botanicals Ayurvedic Oils Organic Healthy Hair Oil - Utilizing Bhringaraj known as the 'ruler of hair' it rejuvenates the hair and scalp assisted by the cooling and cleansing effects of Amalaki and Brahmi (Goto Kola). The Certified Organic Herbs together are used to infuse the oil with qualities known to Ayurveda to strengthen and protect the hair. It is meant to be used on a weekly basis, apply on and massage scalp for 30 minutes as a pre-treatment BEFORE you use your shampoo. Ƹ̵̡Ӝ̵̨̄Ʒ - Fine Ayurvedic Soap in Cedar Eucalyptus - With Earthy Scents of Cedar, Eucalptus and patchouli this invigorating soap is going to give you a refreshing start to the day it contains Saponfied oils of Olive, Coconut, Palm and Essential Oils of Himalayan Cedarwood, Eucalyptus, Patchouli and Vitamin E.
Ƹ̵̡Ӝ̵̨̄Ʒ - Pure Indian Foods Certified Organic Grassfed Ghee Made from Non-Homogenized Milk - Ghee is a healthy, shelf-stable alternative to plain butter or other cooking oils. Indian Ghee is used as an ingredient in traditional dishes as an ideal fat for frying and even used in Ayurvedic Medicine. This Gluten Free Dairy Product is also known as Indian Clarified Butter, Seafood Butter, Drawn Butter, Ghee Butter or Anhydrous Milk Fat, it has a high smoke point which makes it an excellent choice for frying or sauteing and can be stored without refrigeration for months. The next time I make a Whole Lobster or Some Snow Crab, I am using the Ghee as the Seafood Butter that's for sure! Ƹ̵̡Ӝ̵̨̄Ʒ - Nemat International Indian Fragrances: A small size bottle of the Amber Fragrance was included as well as vial size of the Vanilla Musk which I really loved BOTH of them! 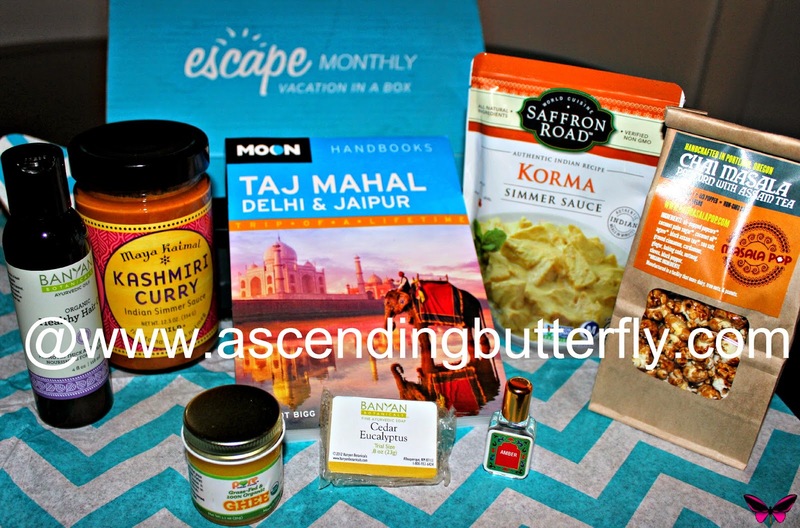 It's a nice taste of India, but now that I heard about the Escape Monthly India Luxe Box, I think that box would have been WAY more ME, with Incense Burners, Pashmina's and other goodies, that one is definitely more my speed. I'm a Luxe Lover! I love the sauces that were included in this box as I'm a huge curry fanatic and as I have never tried Korma Sauce before that one was also fun to use with the Ghee and prepare something different. Even our palates get bored when we eat the same things all the time, so this was a fun way to shake things up at dinner time as well. Bring the exotic into your home, be it bath products, beauty products, kitchen ingredients, cool decor or accent pieces let these boxes that curate a super fun destination for you, bring you a taste of something fun and new! Have you tried Escape Monthly yet? If so, which month was your favorite? If not, what is your current favorite subscription box service? FTC Disclosure: While this is NOT a Sponsored or Compensated Post, Escape Monthly did provide our offices with a Box to help facilitate this review for editorial purposes. All thoughts and opinions are my own. I am disclosing this in accordance with the Federal Trade Commission 16 CFR, Part 255 - Guides Concerning the use of endorsements and testimonials in advertising, you may check our Giveaway and Disclosure Page for additional information regarding Ascending Butterfly Disclosure. This is the first time I have heard of this subscription! @Censie - Saw it scroll by on Facebook Feed as an Ad, and as soon as I saw it I knew I had to try it! Travel and Music are my two biggest passions in life, this is right up my alley with a new destination/theme each month! I love this idea for a subscription box!I would have to have a theme party every month to really get in to it more! @Mom of Two - I know right!!?? It's one of those homer simpson, slaps my forehead and go 'DOH!' why didn't I think of that moments! I love bringing back unique items from my travels, this is exactly what I do when I travel anyway! Oh I love this idea!!! I think I may just sign up for this and give it to my hubby for our anniversary! It sounds like a great at home date night!!!! @My Captivating Life - It would definitely be perfect for both a home date night and an anniversary gift for the hubster! @My Captivating Life - Off to check now, I hope I'm not too late! @pixiedusk - Beauty Boxes are definitely more common, but I really like to seek out unique ones. I also love Fab Fit Fun. Escape Monthly is definitely a great concept, I look forward to trying out other boxes! I love to find new foods and products ,so what a great way to do it . @Big Happy Buddha - The Escape Monthly boxes are definitely a fun way to take a trip to a new destination with a little bit of something for everyone! Let us know if you do try a box! I haven't heard of this box before. I'm always looking for new food to try! I keep getting emails but still haven't signed up for this one yet. I love the theme. I have never heard of this but what a great idea! I will have to give it a try! The Escape Monthly box looks like a great one. I love the different products you get to try out from a different place! I think the popcorn treat sounds pretty tasty. This is a fun box! What a cool subscription box! A great way to try new things. I think subscription boxes are so fun! I'd love to try this one out! I love, love subscription boxes! I heard about this one too. I love monthly subscription boxes. This is a great way to experience another culture from home! This is the first time I've seen this subscription box. It looks amazing! This sounds like so much fun! You get to learn a difference culture every month! How cool- this seems awesome :) Thanks for sharing! This is so neat! My family and I always love trying out new things! I haven't heard of this specific subscription box before. I might have to look into it. I love this idea. What a fun subscription box that I think we would so enjoy. This vacation subscription box is different from others I have seen. I really like this idea of being able to travel to different nations from the comfort of my home. This sounds like such a fun subscription! I would definitely check it out. I love subscription boxes like these. Getting surprise products is so fun! I have seen this around the Internet, but I did not know that they do international boxes too. I would have loved to have tried the Chai Masala Popcorn with Assam Tea - that sounds delicious!